Newly built to a high-specification, Suntrap Hideaway occupies a secluded position in the pretty village of Sticker, three miles from Cornwall's golden Riviera coastline, next to pasture land and the owner's residence from which it is well screened. 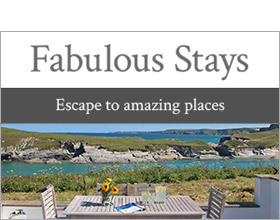 A village hideaway which promotes relaxation and is less than a 15 minute drive from the coastal footpath and white-sand beaches at Porthpean and Pentewan, the romantic port of Charlestown, the renowned Eden Project, the award winning Lost Gardens of Heligan and an 18 hole golf course. The interior design is presented to an excellent standard. Glamourous furnishings, sleek glossy finishes and a light and airy ambience give this detached and spacious bungalow a striking and contemporary edge. A special feature is the hidden courtyard garden which is a huge attraction for sun worshippers and its enclosed perimeter offers peace of mind for parents and dog owners. The wood burner is a stylish statement and combines with under floor heating to provide cosy accommodation for winter breaks. Both bedrooms are equipped with seriously comfortable mattresses and share a large bathroom equipped with a walk-in shower and a bath (with shower attachment). Scenic walks can commence from the front door step and nearby at Pentewan Valley along peaceful woodland and riverside trails. The cycle hire facilities at Pentewan are popular among families as the trails are both traffic free and level and there are picnicking areas en-route. There is a children's play park 200 yards from the property and on wet weather days the bustling town of St Austell (3 miles) offers a cinema, bowling alley and indoor facilities at Kidzworld. The village boasts an award winning inn/restaurant and a convenience store/post office and Cornwall's capital city of Truro, exclusive waterfront town of Fowey and fishing village of Mevagissey are all within a 10 mile radius.